Are you bored with seeing the same old house plants growing in your orangery? If so, why not take a different approach to indoor gardening and create your own carnivorous plant collection? Be inspired by the Siena Botanical Gardens in Tuscany, Italy and the Russian Academy of Science Botanical Gardens in Moscow, both of which feature this unique genus of plants in their orangeries. The exotically named Venus fly trap, the dainty sun-dew and the awe-inspiring pitcher plant are fascinating to grow and will be a great talking point when you have visitors in your home. To get started with growing carnivorous plants it is useful to understand where they grow in the wild and the conditions which they thrive in, so that you can imitate these conditions as closely as possible. Carnivorous plants are found across the globe, and there are more than 630 separate varieties in total. Generally, carnivorous plants grow in bog and marshland habitats with poor soil and lots of sunlight. Primarily the plants absorb nutrients by catching flies and other small insects, and the methods they use to do so are diverse. Some carnivorous plants rely on sticky secretions which work like fly paper while others drown their victims in a pool of liquid. The basic care instruction for growing carnivorous plants is to pot them up in nutrient poor soil, with plenty of space to grow. Between February and October the potting medium must be kept moist at all times; however, during the dormant period of November to January, the soil should be allowed to dry out before watering. During dormancy, carnivorous plants usually grow more slowly or die back to grow new foliage the following season. The plants mentioned in the introduction, above, are the easiest for the home gardener to acquire. Although carnivorous plants can be grown from seed, it is usually recommended that you purchase a healthy plant to give your collection a head start and avoid disappointments. Carnivorous plants can be purchased in specialist nurseries and some florists. The image of a Venus fly trap is probably the first that comes to mind when someone mentions carnivorous plants. With a central rosary of leaves, tipped with snap traps, this bug catcher is a design masterpiece of the natural world. Tiny hairs on the surface of each hinged trap are stimulated by touch and close to ensnare whatever insect has been unlucky enough to pass by. With large jug-like structures which hold a pool of sticky, scented liquid in the base, pitcher plants are less active than a Venus fly trap but equally effective killers. Insects are drawn to the nectar, which they fall into and cannot escape from. Enzymes found in the nectar absorb the nutrients to feed the plant. The sun-dew is one of the smaller carnivorous plant varieties and has its own particular charm. Each leaf of the low growing plant is covered with tentacle-like glands which excrete a drop of fly attracting liquid - to the human eye, these droplets look like tiny crystals. Always use rain-water on your carnivorous plants - the minerals found in tap water will kill your plant! Don't use fertiliser to encourage your plants to grow more quickly. Since carnivorous plants absorb nutrients from the flies and insects they catch, adding plant food can upset the delicate balance. 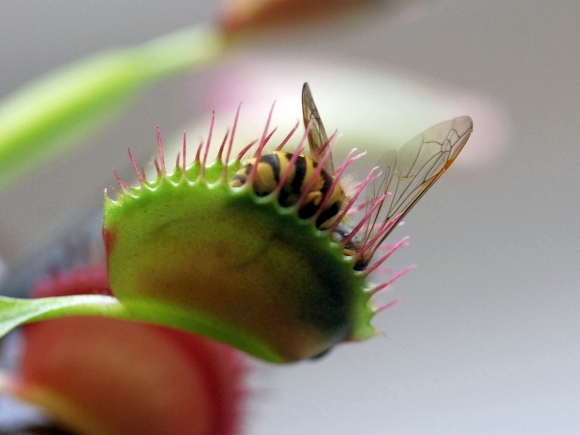 If you have Venus fly traps, resist the temptation of setting the traps off. This wastes energy and with repetition, your plant will shrivel and die. Always study the care instructions for your carnivorous plants as different species may require less or more water, sunlight or humidity.